The ongoing threat of climate change and hazardous air quality in urban environments continue to foster sustainable elements within architectural design, ranging from the installation of photovoltaic panels to rainwater harvesting mechanisms. But what if a facade curtain could directly capture CO2? Responding to this challenge, London-based practice ecoLogicStudio, led by Claudio Pasquero and Marco Poletto, unveiled Photo.Synth.Etica at Dublin’s Climate Innovation Summit 2018. The large-scale installation is capable of absorbing two pounds of carbon dioxide per day with the help of an injected algae solution. Photo.Synth.Etica consists of 16 approximately 6.5-by-23-foot bioplastic modules. For the design of the modules, the team interpreted a breadth of data charts stemming from carbon trading transactions, rationalizing them into the welding pattern located between the two layers of bioplastic. Spanning the height of two levels, each module is laced with a coiling void that is injected with micro-algal cultures treated to produce luminescent shades at night. The density of the algae biomass is customizable and can be altered for desired light transparency. 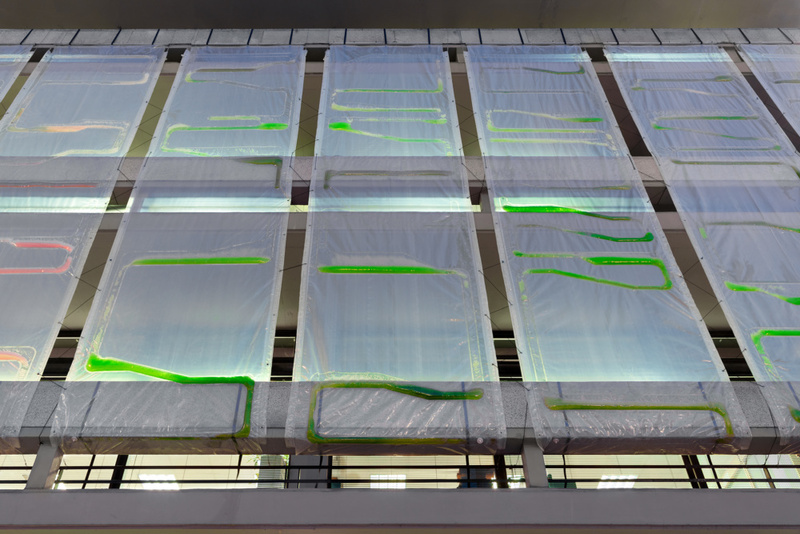 The mechanics behind the installation’s air filtration are fairly straightforward: unfiltered air rises from the base of the facade through the cylinder of photoreactive algae, interacting with carbon-consuming microbes. Once captured by the algae, the biomass can be cultivated as a raw material for the production of bioplastics similar to that used for the curtain modules. According to the design team, this particular module “is particularly suitable for retrofit as it is very lightweight, soft, adaptable, and does not require heavy substructures to be installed.” Additionally, ecoLogicStudio has developed higher-end ETFE models of the algae-injected curtain for new construction. Currently, the firm is researching a mass-market prototype that will target the large shed or warehouse typology, with an aim “to cover the large surfaces of malls, distribution centers, and data centers.” Research for the project goes back nearly a decade, including the similarly air-filtering Urban Algae Canopy unveiled at the 2015 Milan Expo. ecoLogicStudio is scaling up their technology with the intention of marketing the new prototypes in 2019. Algae: it's the slimy green stuff you find in ponds and canals. Other than that, perhaps you've seen a commercial from a climate change-denying energy company praising the plant's potential. But aside from these instances, not much else is known. That is why the IKEA-funded research group, Space10, off has teamed up with three architects to spread the word about algae's many capabilities. Working from Copenhagen, Space10 architects Aleksander Wadas, Rafal Wroblewski, and Anna Stempniewicz, along with Space10's bioengineer-in-residence, Keenan Pinto, produced the "Algae Dome." 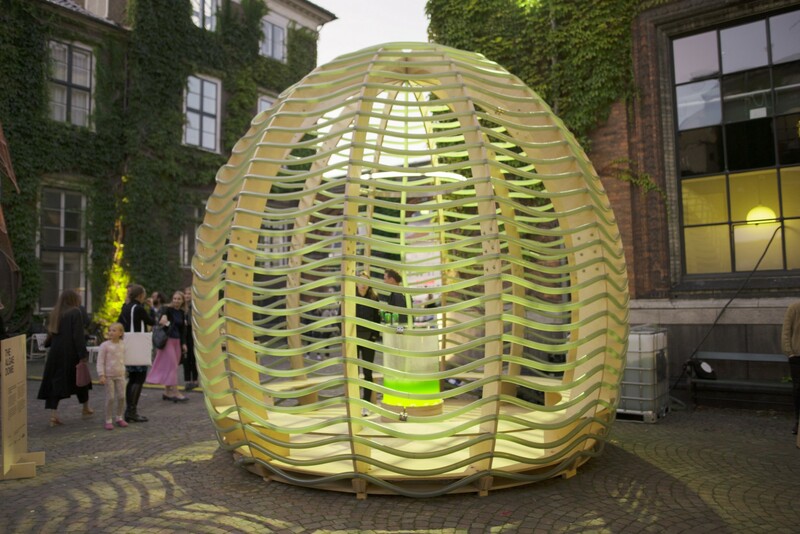 The 13-foot-high dome was dubbed by the team as a "food-producing architecture pavilion" and was exhibited at the CHART Art Fair in Copenhagen in early September. Algae is a photosynthetic organism that uses sunlight to convert carbon dioxide and water into energy, emitting oxygen and biomass in the process. It has relevant applications for issues like climate change and malnutrition. Space10's dome, with over 1,000 feet of tubing wrapped around the timber structure, served as a photo-bioreactor. The translucent tubing was mostly green throughout the three-day fair as algae flowed through it, with 118 gallons produced in total throughout the fair. Space10 were able to harness a lot of algae because it is one of the world's fastest growing organisms. Some species are "capable of doubling in volume in just six hours," Space10 noted. https://www.youtube.com/watch?v=xFt4Mjna2dk Algae also has potential as a food in the form of spirulina, a strain of microalgae. According to Space10, spirulina contains a wealth of nutritious vitamins and minerals, containing hefty amounts of calcium, niacin, potassium, B vitamins and all essential amino acids. Furthermore, spirulina has more beta carotene than carrots, more chlorophyll than wheatgrass, and 50 times more iron than spinach. Whether it tastes nice, however, is another question—but one that CHART-goers might be able to answer. The research group advocated for algae production outside of their dome. "Picture kitting out bus stops with algae that stripped greenhouse gases from the atmosphere and produced spirulina that could be used to bake fortifying bread for malnourished families," Space10 argued. They added that such a proposal isn't such a fantastical idea, citing French and Dutch firm Cloud Collective's algae motorway farm in Switzerland and Artveoli's air-purifying wall panels. All the chatter may be around Frank Gehry and the Los Angeles River, but that waterway is not the only channelized river on the West Coast. More than 40 years ago a 10.5-mile long stretch of the Tijuana River was concretized as a flood control channel to make more development possible. If Gehry’s scheme is all about hydrology, a new proposal for the Tijuana River is about electricity. René Peralta and Jim Bliesner’s scheme for an energy farm combines large arrays of solar panels with an algae system to remediate the water headed for the Tijuana River Estuary and the Pacific Ocean. According to Peralta, the system would produce enough megawatts to power 30,000 homes or a 112-acre industrial park. The plan came out of a class developed as part of UC San Diego Urban Studies and Planning Program, where both men teach. Additionally Peralta directs Woodbury University’s Landscape + Urbanism Master of Science program and Bliesner leads the nonprofit Center for Urban Economics and Design. While generating power is important, the pair see overall regional sustainability as critical goals. According to a story in the San Diego Union-Tribune, they’ve presented their work at the environmental conference Green Tijuana-San Diego Verde and have spoken to North American Development Bank. Their preliminary analysis suggests that the solar panels could help decrease the current heat island effect impacting Tijuana’s dense urban neighborhoods by lessening solar radiation in the summer. They also proposed a partially roofed section of the river to create shade over the brutal concrete channel. Other potential infrastructural upgrades would include tree grids on top of the canal and floating algae pools that would sequester CO2 levels generated by vehicle emissions (the canal is flanked by roadways). Although the project is in preliminary stages and still needs governmental support, it offers a much needed “hack” in the face of ecological and social costs in Mexico. 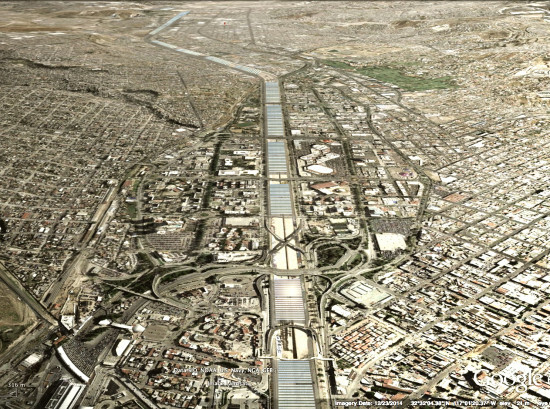 Or as Peralta told Sandra Dibble of the Union-Tribune, “[Tijuana] does not have the luxury of reinventing the river to what it once was.” He noted that the solution comes from “hybridizing its old infrastructure with new technologies.” It’s about teaching an old channel some new tricks.